As a competing vacation rental, it can be hard to have your rental be found above those who you compete with. Some of you may wonder, ‘What is SEO and why is it important?’. SEO stands for ‘Search Engine Optimization’ and it is a pivotal factor for ranking among other vacation rentals. Your listing must stand out to help you achieve your number one goal, which is ofcourse to receive bookings. In this post we will discuss tactics that will help you to improve SEO for your vacation rental. The first step you will want to complete is to make sure you have a complete profile. Make sure that you have a complete and accurate listing so that guests will know what to expect from your rental. List all the appliances and amenities your property has. This way if a potential guest filters for example that they only want to stay at a property with a barbeque and you have one, you want to ensure that you added this into your listing so you will show up in search results. You also want to show off what your home has to offer, and there is no better way to do this than beautiful photos of your clean vacation rental. The quality of description and title for your listing are going to reflect in the amount of bookings you recieve. A potential guest may be looking for a space just like your rental, but if you do not have a title that properly describes your property, guests may not find you. For example, it is wise to add into the title how many bedrooms your rental is as well as another charming factor. If you have a prime location for a popular area add in your title ‘Great location’. If you have a renovated or modern home, flaunt that in your title. Have a title that makes the listing worth opening. A high response rate is important to have to improve ranking and to have the impression of a responsible host. To have a high response rate you simply need to respond to inquiries in a timely manner. Besides just the appearance of a high response rate, it is a great quality to have as a host to respond quickly to guests and to be helpful in responses. If you already have a 100% response rate, great job! Keep up the good work. 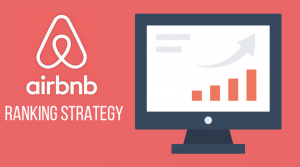 It goes without be said- the higher your ratings on Airbnb the higher you will rank. This is among the top if not the most important tip to boosting your SEO. The tips given above including an accurate listing and high response rate are two ways to receive high ratings. Don’t be discouraged if you get negative feedback, this happens to all hosts and all you can do is your best as a host.